Gatefold 180g vinyl with Obi Strip. Time Capsule is a new reissue label that unites the record collectors and DJs of Brilliant Corners and Beauty & The Beat communities in London. For each release, Kay Suzuki works alongside one co-curator to reinstate and repackage the music they hold dear into perfectly restored historic artifacts. For the first release, Brilliant Corners regular and Meda Fury signing Ryota OPP curates the reissue of Il Guardiano Del Faro's 1978 album "Oasis". Born in 1940, Milanese musician Federico Monti Arduini was a child prodigy who studied piano and was already performing at concerts from the age of eight. He composed pop songs for other artists which sold millions of copies, but his own solo success came after he encountered synthesisers in the early 70s. Viewed as a precursor of New Age sound art, Arduini was one of the first producers in Italy to use the Moog synthesiser and a meeting with Bob Moog in New York only added to this obsession. He was also an early adopter of the tradition among electronic producers to use a moniker to hide his identity. Il Guardiano Del Faro (translated as 'the guardian of the lighthouse') is a nod to the small Italian fishing town Porto Santo Stefano, where Arduini created his studio in the mid-70s. He produced a number of albums from this seaside idyl of electronic instruments and tape recorders, but "Oasis" stands out from the pack. Released in 1978, it became a cult classic for its experimental sounds and emotional expressions. Spiritual synth sounds cover the album in a dreamy haze, oscillating between ambient and psychedelic. Sparing deployment of the Roland rhythm box gives dance floor favourites "Disco Divina" and "Oasis" touches of space disco and even teases proto-house elements like the great Sun Palace. Patrick says: New firm Time Capsule kick things off with a welcome reissue of 1978 library-style synth gem "Oasis" from Italian maestro Federico Monti Arduini, an essential listen for the cosmic and Balearic fans alike. 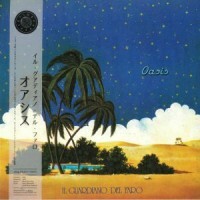 Kay Suzuki enlists the co-curatorial skill of Ryota OPP to give this diamond the TLC it deserves, presenting "Oasis" in a gatefold sleeve with a gorgeous obi and precise remaster.